Tunnel ventilation is a variation of cross flow ventilation often making use of the end wall of a poultry or dairy facility to maximize ventilation requirements. In extreme heat conditions this system allows high velocity air to move across the livestock. 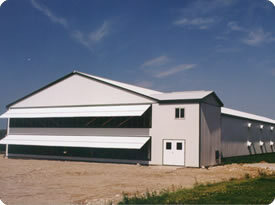 End walls and/or sidewalls are equipped with sliding panels/curtains (internal or external mounting) that adjust to satisfy the negative pressure created by the bank of fans located in the end walls of the barn. This system may only be utilized 10% of the total year but is necessary for healthy livestock.